With each generation of GoPro cameras the image quality becomes better and better. The resolution increases, colors are more vibrant, sound becomes more realistic and the frame rate increases even further. However, GoPro can only stabilize the videos you shoot with your GoPro so much digitally. Since GoPro cameras are so often used in sports and other activities with a lot of movement this causes a lot of unwanted camera movement and shake in your videos which decreases the quality. To remove unwanted movement and vibration from your GoPro videos you can use a camera stabilizer. In this guide we’ll explain the different types of stabilizers available and review the best stabilizers you can buy. There are two different kind of devices you can use to stabilize your GoPro videos. Gimbals and stabilizers (sometimes referred to as steadicam). Each device has its own pros and cons and one is not necessarily better than the other. Let’s look at each device, how it works and what the pros and cons are. After you know which stabilization device is better suited for your needs you can look at our top 3 recommendations for each type of stabilizer. A gimbal is a high-tech piece of camera equipment that removes unwanted camera movement and shake by countering the movement with motors. Once you have mounted your GoPro on a gimbal it will monitor all the movement of the camera operator (you) with an inertial measurement unit (IMU). Using algorithms the gimbal will be able to notice the difference between unwanted movement and deliberate movement. If it detects unwanted movement or vibrations it sends a signal to one of the three motors to counter the movement. This allows you to create incredibly stable video footage and make it seem as if your camera is floating in the air. Most gimbals are able to shoot in multiple modes and lock or stabilize different axis depending on the shooting situation. Stabilizers don’t use any fancy gyro technology to stabilize your shots but instead rely on counterweights to stabilize video footage. This also has its own advantages. These stabilizers are much cheaper than gimbals and are great if you are just starting out. Stabilizers usually work better for low angles and you will never have to worry about running out of batteries since they don’t use any. That said, the stabilization performance of a gimbal is much better than a stabilizer/steadicam. Our number 3 gimbal is the Feiyu G3 Ultra. This is the most popular gimbal on the market because it’s cheaper than other gimbals but still provides ok stabilization performance. So this is the best bang for your buck model if you don’t want to spend too much money. The G3 Ultra is made of durable brushed aluminum and is compatible with every GoPro Hero camera except the Hero 4+. 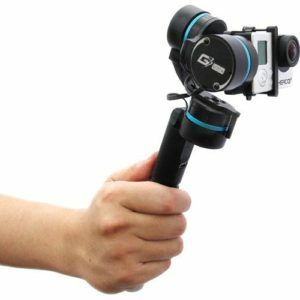 This gimbal shoots in three different shooting modes that can be controlled with a single button on the handle of the gimbal. The LED indicator will indicate which shooting mode is currently enabled: Fixed axes or on of two Pan/Tilt following modes. 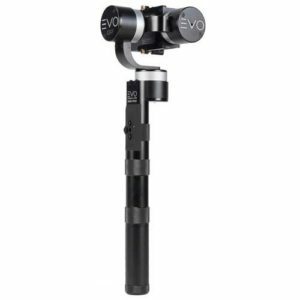 Our number 2 gimbal is the EVO GP. This gimbal delivers unparalleled stabilization and camera feathering performance using its high power, high torque brushless motors. 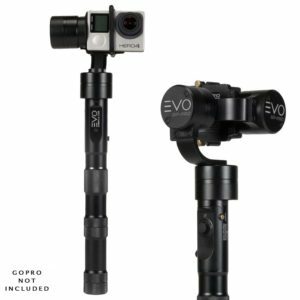 The EVO GP is compatible with all GoPro Hero cameras to help you produce high-quality, stable video with ease. No complicated calibration or setup procedures. Simply turn the gimbal on and you’re ready to record stabilized video. To make shooting stabilized video easier the gimbal has four different shooting modes. Heading/pitch follow mode, heading follow mode, inverted mode and full lock mode. The EVO GP is made of high quality CNC alloy which is extremely durable. This is also backed by a 1 Year USA parts and labor warranty so you are covered in case something does break. The EVO GP has a built-in charging cable for your GoPro but it’s also compatible with the GoPro battery bacpac or any other accessories like the LCD bacpac. The battery life of the gimbal is around 4-5 hours of recording which should be enough for most people. You can also buy extra batteries so you can easily swap them and continue shooting. It features a 4-way thumb stick which allows you to control the roll, pitch and pan of the gimbal with precision. You can also manually control the panning when the gimbal is in lock mode. The bottom of the handle is threaded so you can mount an extension pole, monopod or tripod. It has a 3.5mm A/V output port on the handle of the gimbal which can pass an audio and video signal from your GoPro to an external field monitor. It uses updated motors and position encoders. If you don’t necessarily need any of these pro features we recommend going for the regular EVO GP (number 2 in this list). The non-pro version of the GP EVO performs similar in terms of stabilization performance but is a bit cheaper. The GP-Pro allows you to shoot incredibly stable, high-quality video footage with your GoPro Hero camera. No complicated calibration or setup needed. Just attach your GoPro, power on the gimbal and you are ready to start recording. 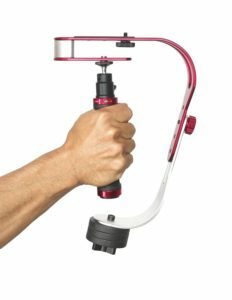 The gimbal will automatically start stabilizing your footage using high power, high torque brushless motors to counter any unwanted movement or camera shake. You can choose to shoot in one of the four dynamic shooting modes: heading follow mode, heading lock mode, heading/pitch follow mode and inverted mode. The GP-Pro is made of aircraft grade CNC aluminum and backed by a 1 Year USA parts and labour warranty. It’s compatible with GoPro accessories like the LCD bacpac or battery bacpac and has a built-in charging cable to extend your GoPro’s battery life. 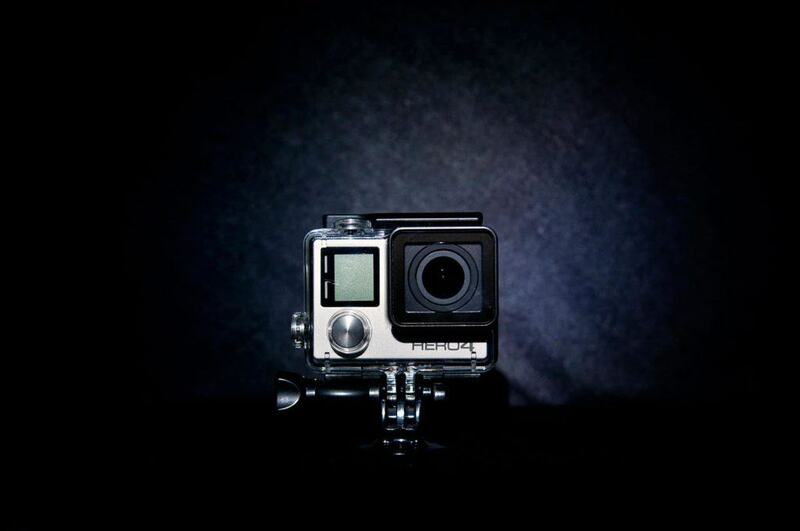 Our number 3 is the Opteka X-Grip specifically made for GoPro Hero cameras. This C-shaped stabilizer is made of high-grade ABS impact-absorbent plastic while the handle is padded with cushioned NBR. Even tough this stabilizer was made specifically for GoPro cameras it also fits most compact cameras and camcorders with a standard 1/4-20 thread. The rails are made of non-slip rubber to prevent mounted cameras from moving around while you are shooting video. 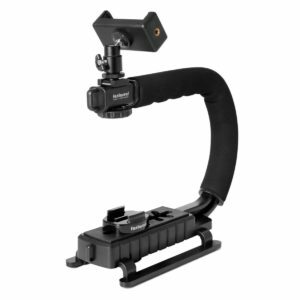 The Opteka X-Grip also features a (removable) accessory mount. You can use this accessory mount to attach video lights, an external microphone or a flash. The stabilizer ships with a 1 year Opteka warranty. Our number 2 stabilizer is the Fantaseal 4-in-1 Camera Stabilizer. This lightweight C-shaped stabilizer has a shock-proof EVA handle which offers a comfortable and secure grip for long time use. EVA materials is a foam like material that absorbs shocks and is also often used in sport shoes. This stabilizer is made of a strong plastic which keeps the weight down while offering good strength. The Fantaseal stabilizer stands out from the competition because it’s incredibly versatile. 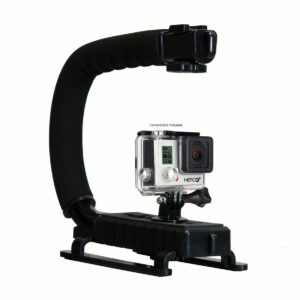 You can mount your GoPro on this stabilizer using the GoPro quick release buckle plate but you can also mount other action cameras, a DSLR or a camcorder. You can even mount your smartphone using the powerful anti-loose cell phone clamp mount if you want to record video with your phone. This stabilizer also features a removable mini ball head hot shoe adapter which you can use to attach your phone for use as a video monitor. Simply download the GoPro app and connect to your GoPro camera to preview your shots. If you remove the ball head adapter you can use the stabilizers built-in hot shoe. You can use this hot shoe to attach an external microphone or LED lights. Our favorite GoPro stabilizer and number one in this list is the Roxant Pro GoPro Stabilizer. This compact and durable stabilizer provides professional style stabilization to minimize or eliminate unwanted camera movement or shake. In terms of stabilization performance this stabilizer outperforms all it’s competitors in the same price range. The Roxant Pro is small, well-built and provides excellent performs. If you want to record stable video footage with your GoPro camera we highly recommend the Roxant Pro! It can be difficult to choose whether to order a stabilizer or a gimbal for your GoPro videos. Hopefully we’ve explained the differences well and helped you picked the right equipment to shoot more stable videos. Beginners on a budget usually choose to start out with a regular stabilizer since these have less moving parts and are cheaper. The gimbal offers better performance but is also more expensive so it’s most often bought by more serious and regular video creators.